The new Fujifilm FinePix F800EXR introduces wireless image transfer, 6 artistic filters and a slightly cheaper price to Fujifilm's travel-zoom range, but image quality and RAW processing speeds are still problematic and we miss the F770EXR's on-board GPS features. Wireless image transfer is the principal reason behind the release of the F800EXR, and while we applaud Fujifilm for quickly coming to market with one of 2012's key features, the implementation leaves something to be desired. Having to pair the camera to a smartphone or tablet to transfer images and to sync GPS co-ordinates just isn't as fast or as intuitive as having those features in-camera, although it does at least avoid unwanted batter drain. There are other cameras available, particularly Samsung's newer models, that offer a much slicker implementation of wirelessly sharing your image. The F800EXR has the same 16 megapixel EXR sensor as its predecessor, which offers an ISO range up to 12,800, fast continuous shooting speeds and full 1080p HD movies. As you'd expect, we found that the sensor again suffered from noise even at the base ISO setting of 100, showing further artifacts and loss of fine detail at the slow speeds of ISO 200 and ISO 400, with higher settings becoming progressively noisy, which means that Fujifilm's travel-zoom camera still lags behind the main competition in this all-important regard. The user interface principally benefits from the customisable Function button and the large and tactile hand-grip, while start-up and shot-to-shot times are fast enough to not be noticeable. Shooting in the RAW format is still sadly something of a chore, though, with slow shot-to-shot times and the camera only capable of taking 2 pictures before locking up completely to process them, making that it wise to use JPEGs most of the time. 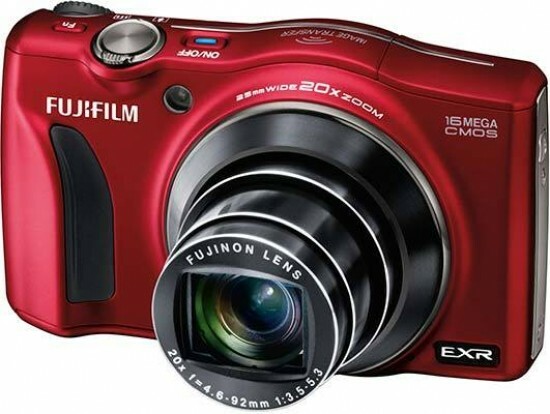 Thanks to a fairly significant reduction in price, we can still just about recommend the Fujifilm FinePix F800EXR as a versatile pocket camera, but the next generation really needs to improve on image quality and wireless integration to catch-up with the competition.